I really like an organized home. When things get all chaotic and messy, I find that my mind kinda’ gets that way, too. But when everything has a place—and everything is in its place—I feel a sense of peace. I can think straight, relax and enjoy. I really like an organized garage, too. 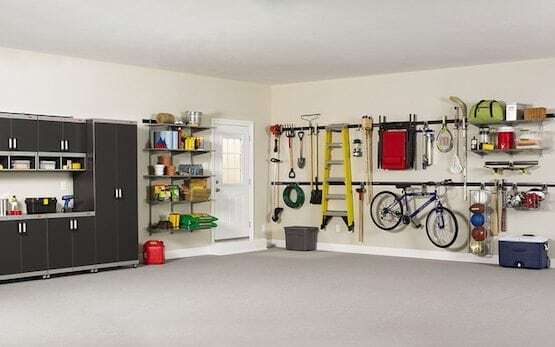 At least I’ve enjoyed the pictures I’ve seen of garages that function in all the ways that garages are supposed to. Let’s just say I haven’t experienced this first hand. Faithful readers know that my husband is a woodworker—a master craftsman. He remodels our homes, designs and builds heirloom furniture. This amazing talent does come with unintended consequences. Let’s just say the man does not possess a single iota of organizational talent. I’ll leave it there, although I could offer several pictures examples to illustrate my point. For 27 years we had a two-car garage, also known as the hubs’ workshop—and for the record, there was no space in this garage for a vehicle of any size. Soon, we will move to a home with a beautiful, pristine, three-car garage—complete with built-in cabinetry and extensive pegboard. I worry that instead of a regular-sized chaotic, messy workshop we’re going to end up with an extra large chaotic, messy workshop. And still no room for a vehicle of any size. My sweet husband has promised me this will not happen—that we will have room for two vehicles and it will be neatly organized and tidy, while still fully functioning so he can make me stuff. I believe. Sure I do. And to that end, I’d like to suggest a couple of neat tips and tricks that will help keep him organized. Carabiner hooks. I know how hard it is to keep tools organized and by organized I mean “able to be found.” A carabiner is an oblong metal ring with one spring-hinged side that is used especially in mountain climbing to connect stuff. They’re easy to open with one hand and come in all sizes from itty-bitty keychain size to big ones. A carabiner is the perfect way to organize box-end wrenches and other items that have a hole in the handle. We will have dozens of these, which should tell you just how many tools he has because you need many when you cannot find any of them. Magnetic bowls. Random nails, brads, screws, bolts, staples and other small, pointy, metal objects can be quickly corralled in a magnetic bowl. Just remember, Honey, this is not a handy place to set your mobile phone, or any other thing electronic that does not play well with magnets. He will have a number of magnetic bowls to match the many different sizes of screws, bolts, nuts, nails and brads that master craftsmen (and auto mechanics) require to be really good at what they do. Magnetic trays. I think we will need a dozen or so magnetic trays to keep long objects like wrenches, pliers and screwdrivers organized and also handy when needed. Really, this is such a brilliant idea. I’ve seen how my husband works. He uses dozens of tools at the same time and he isn’t about to run back to a cabinet or bin between every use. Hangers. Not clothes hangers, but a quick system like this, is just great to keep odd-sized things off the floor and visible so they are handy. The hubster will need an entire wall of these. Given the great reviews and reasonable price, he’s going to be one happy camper. While we wait out these last few months, we are having a great time planning. In fact, the hubs is really getting into the ideas I’m coming up with for how two vehicles will be able to get along with a wood working shop. While he promises me his shop will be confined to a single space, I’m not taking any chances. I’ve been promoted to Shop Assistant and you can be sure I’ll come fully prepared with carabiners, magnetic bowls, and trays in multiple colors and sizes. And something else. I’ve got my eye on a killer sawdust-collection system.